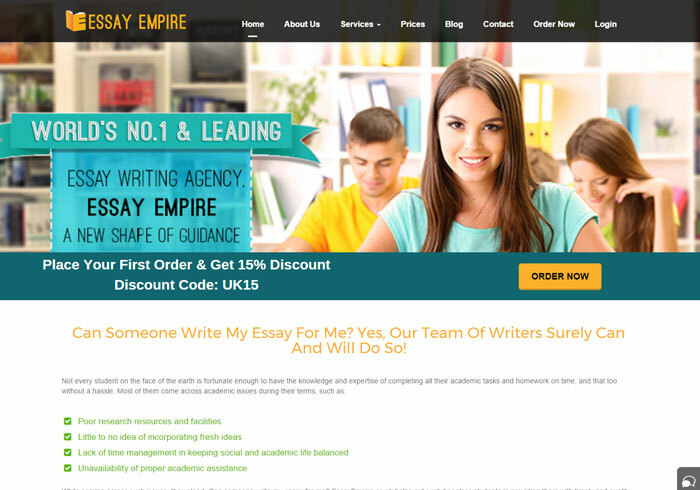 Today we will see what is hidden behind the ambitious claim of being the world’s no.1 essay writing agency stated on www.essayempire.co.uk. We will check its prices, options, safety of ordering, and value for money, i.e. quality. The prices depend on the deadline and type of paper, starting from £10.39 for 10-day deadline (the maximum one). We must admit that there are a lot of services which are a way cheaper than this one. The set of options offered is quite unexpected as for a custom writing company, and this is not a good surprise. Deadlines for papers start from 24 hours, so if you need a work to be done overnight, forget about this website. For some types of papers, such as Dissertation Chapter, you will be able to choose a deadline that is longer than 7 days, so the service will make you wait for a long time. You can order essays, articles and all other kinds of papers which somehow relate to academic field. There are also some unclear things such as “Assignment”, and one cannot get what this is about, since every paper may be understood as an assignment. Math problems and answers for multiple choice questions are also confusing, as you pay per one problem or answer, no matter how complex it is. The prices do not vary according to the complexity level. This means that a High School essay will cost the same as a Master’s level one. This makes a customer believe that there will be no difference in quality as well. There are two quality levels offered: standard and premium. This means that an essay of standard quality will still have a lot to be improved. Moreover, some assignments, such as Math Problem, have no premium quality, so you need to get ready to the mediocre (if you are lucky) solution. There are also editing and paraphrasing services. We have failed to find an explanation of what a person gets if order one of these services. Also, there is an “admission essay services – Editing” option, and this is a copy paste from the website, not our spelling error. Again, what is the difference between editing and admission essay editing and the reason why there is a need to separate admission editing into a category – remains a mystery. This was one of the major concerns of our team of mystery customers. The terms and conditions, as well as the refund policy, are not only quite short, they do not cover the main cases that may take place, and, what is more, they are written in a completely inappropriate language. The grammar of most sentences makes it unclear to understand what they are about at all. So, we would say that the service’s safety level is close to 0. Finally, we have decided to test the service in practice and placed an order for an assignment to be completed with premium quality and within 24 hours. We have found quite a complex task in Technology to see how the so-called no.1 service would cope with it. In approximately a day and a half, we got our “premium quality” paper with lots of mistakes and inaccuracies. Mostly, it was incorrect even from the grammatical point of view, to say nothing about the inaccuracy of calculations. We were completely dissatisfied with what we got, so our hopes were disappointed. To crown up, this service is not worth of the title it claims to have. It is definitely not the number 1 writing agency. Moreover, we would not recommend it to our friends unless they want to fail with their assignment.